K-Team was initially a startup form the EPFL in Lausanne resulting from the success of the Khepera robot. The Khepera was developed at the LAMi in EPFL in 1991. Initially developed for their own use, the Khepera met a real success in the universities all over the world. To satisfy the demand, K-Team was founded in 1995 with the goal of developing and commercializing robots dedicated for the research. Others platforms such as the Koala were developed on the same basis, offering compact and modular robotic solution for the researcher in various domain. With more than 20 years of experience and know how in mobile robotics, we deliver today highly compact and modular solution in line with the latest research application. Designer and first user of bio-inspired research environments using Khepera. Electronics and software designer for Khepera and additional modules as well as for Koala and Kameleon. 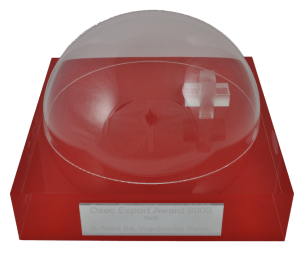 K-Team was award the best export in 2009 for Switzerland by OSEC, the centre of expertise for Swiss foreign trade, for its Kamel project.